These two works may not seem to have very much in common – at least not in terms of size! 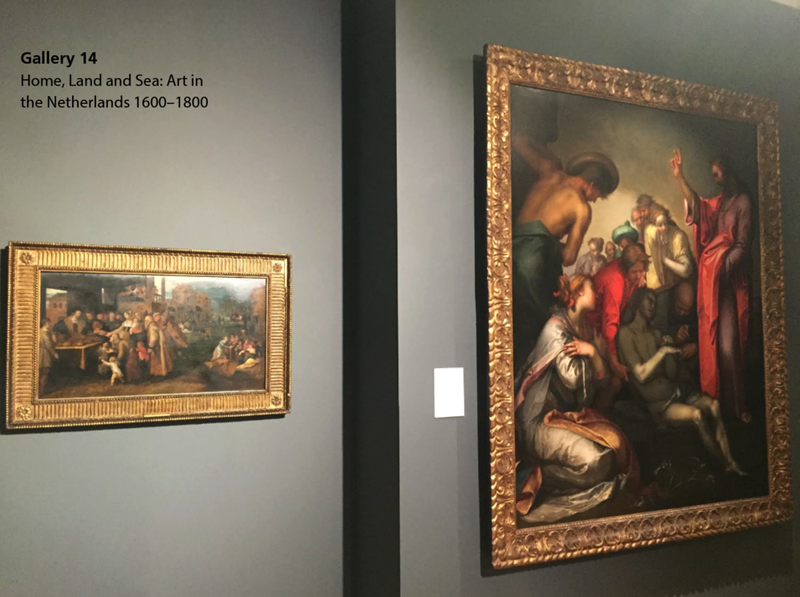 And yet intriguingly, they hang side by side and are the two oldest works that Manchester Art Gallery has on display. Whilst neither gives up its mysteries completely, they both seem to awaken something within us. Even when gazing from a distance, it’s difficult not to feel drawn to the luminous colour that radiates from this rare find. Abraham Bloemaert was both a founder of and the most influential artist in, the Utrecht School but he has a mere seven paintings in the UK National Collection. Manchester proudly owns two of them and you must see his much later, and beautifully tranquil, Landscape with Man and Dog that is just to the right. Not long ago, I was delivering a European themed tour to a group of business people from the EU and as I introduced this work, I saw one of our number leave quite suddenly. There’s no way of knowing of course, but I felt that she was unhappy with what she took to be religious propaganda. It’s an obvious point that we live in a largely secular age, but even the most ardent humanist would be hard pressed to deny that at the very least, this is a gripping piece of storytelling. Christ’s authoritative but reassuring gesture and the presence of so many larger than life figures within a restricted space, both serve to heighten the sense of drama in Bloemaert’s reading of St. John’s Gospel, Chapter 11. For a central character, Lazarus bears a truly startling pallor whilst his sister Martha no longer feels the need to shield herself from the stench as he awakens. But it is the prominence and transcendental quality given to his other sister, Mary of Bethany that really sets the imagination racing. Medieval tradition had also taken her to be the penitent Mary Magdalen who a little later, would be present at the Crucifixion before becoming the first witness to Christ’s own resurrection. And so we are left with a pleasantly haunting sense of prescience. The Raising of Lazarus is one of Manchester’s true greats. Its epic scale and commanding mode of display makes it not only a powerful centrepiece to our own extensive Dutch Golden Age collection – but also a fascinating link back to the Italian Renaissance. For this one, we travel south for nearly eighty miles to Antwerp in Flanders – the very cradle of the Northern Renaissance. And it is significant that our painting here is in oil on panel – in the finest tradition of Van Eyck and Breughel. Perhaps this helps to explain all the beautifully intricate detail that our artist has accomplished. The work may well be of more modest dimensions, but the scale of its ambition is huge. A diagonal from the left foreground leads us from Feeding the Hungry through Clothing the Naked and Comforting the Sick and on to Giving Shelter to Strangers. Similarly, from the right, we encounter Refreshing the Thirsty, Visiting the Imprisoned and Burying the Dead. And where these lines meet, we are startled by the ghostly presence of a distant church looming out of the mist. The artist specialized in allegorical themes and here the ‘Seven Works’ tradition enables a vast array of humanity to be depicted – I always seem to lose count at sixty! And yet many of the faces are very distinctive – each seems to provide a glimpse into an individual personality and a unique life story. One of the reasons that I keep coming back to this little masterpiece is that its remarkable energy is enhanced by such wonderfully deep colour. It is like a portal into an age in which deprivation, war, famine and plague would certainly not have been strangers. And yet at the same time there would seem to have been a strong sense of social conscience, underpinned by what we would hope, is the eternal human capacity for compassion and goodness.